1. What factors affect the rate of a reaction? 2. How does a decrease in temperature affect the reaction rate? Explain the outcome by describing changes that occur at the molecular level. 3. For which of the following two reactions would you expect the orientation of the molecules to be more important? a) Calculate the average reaction rate between 0 and 60 minutes and 180 and 240 minutes. Which is faster? Explain using your knowledge of factors that can affect rate. b) Determine the instantaneous rate at 200 minutes. a) How does the rate change if [E] is doubled? b) How does the rate change is [F] is doubled? c) What is the overall reaction order? d) What are the units for the rate constant for this reaction? b) the pH is increased by one unit? a) Determine the rate law for this equation. b) Calculate the rate constant, including units. a) a second-order reaction kinetic plot? b) a first-order reaction kinetic plot? 12. Common sugar, sucrose C12H22O11, reacts in dilute acidic solutions to produce glucose and fructose, both having the molecular formula C6H1206. a) What is the order of the reaction? b) Determine the rate law and the rate constant. c) Calculate the expected concentration of sucrose after 100 min. 13. The half-life of a first-order reaction was found to be 10 min at a certain temperature. What is its rate constant in reciprocal seconds? 14. The mass-241 isotope of americium, widely used as an ionizing source in smoke detectors, has a half-life of 432 years. a) What fraction of the Am241 in a smoke detector will have decayed after 50 years? b) How long will it take for the activity to decline to 80% of its initial value? c) What would be the “seventh-life” of Am241? 15. A widely used “rule of thumb” for the temperature dependence of a reaction rate is that a 10°C rise in the temperature approximately doubles the rate. (This is obviously not generally true, especially when a strong covalent bond must be broken.) 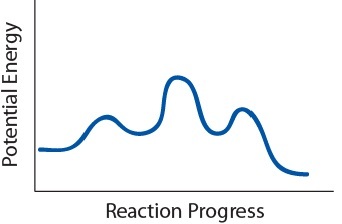 For a reaction that shows this behaviour, what would the activation energy be? Calculate the activation energy (Ea) and A.
d) Identify any intermediates in the mechanism. e) If the first step is much slower than the second, what would you expect the rate law for the overall reaction to be? a) How many steps are in this mechanism? b) How many intermediates are there in this reaction? c) What is the slowest step? 20. What is a catalyst? Explain how a catalyst affects reaction rates. 21. Many solid catalysts are commercially sold as fine powders or small spherical beads. Explain why this might be beneficial. 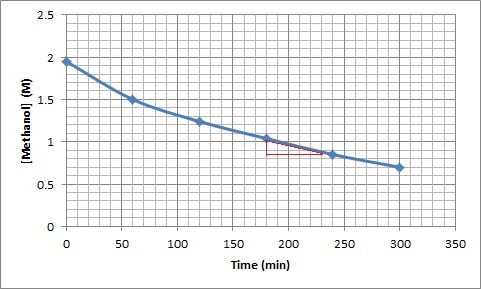 Therefore the average reaction rate between 0-60 minutes is faster. This is because, as the reaction proceeds, the reactant gets consumed to make product, lowering the concentration of reactants. Instantaneous rate at 200 minutes. a) Since the rate is first-order in bromate, doubling its concentration will double the reaction rate. b) Increasing the pH by one unit will decrease the [H+] by a factor of 10. Since the reaction is second-order in [H+], this will decrease the rate by a factor of 100.
c) Dilution reduces the concentrations of both Br2 and BrO3– to half their original values. Doing this to each concentration alone would reduce the rate by a factor of 2, so reducing both concentrations will reduce the rate by a factor of 4, to (½)×(½) = ¼ of its initial value. The rate law is: rate = k[NO]2[H2]. From the above equation, k = –0.693/(600 s) = 0.00115 s–1 15. = (5.76 J mol–1 K–1) / (0.00011 K–1) = 52400 J mol–1 = 52.4 kJ mol–117. Finely divided powders and spherical beads have larger surface areas than big solid chunks, allowing for more sites for reactions to occur, which further speeds up the reaction.